We’ve just passed our one-year anniversary of owning the Ford Transit Van. 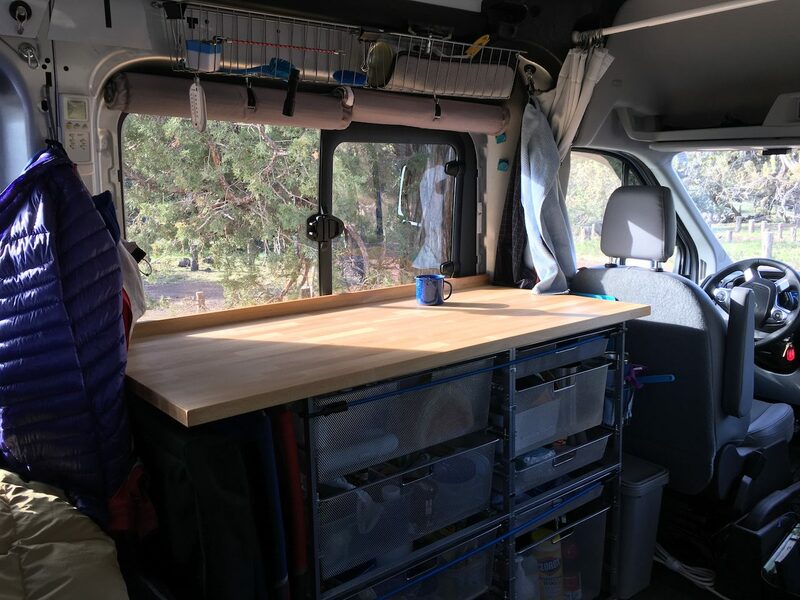 We’ve driven more than 19,300 miles, and slept over 170 nights in it while exploring our home state of Oregon, plus California, Utah, New Mexico, Arizona, Washington, Idaho, British Columbia and Alberta. Our build-out has been slow and incremental over the past twelve months. Many of the latest upgrades, ($3000) are to prepare for our extended cold-weather trip across the country this fall. 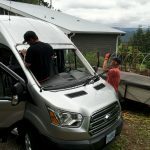 If you’d like, read more about our Transit van purchase and the original build-out posted last November. Lots of things have changed since then, so read on! 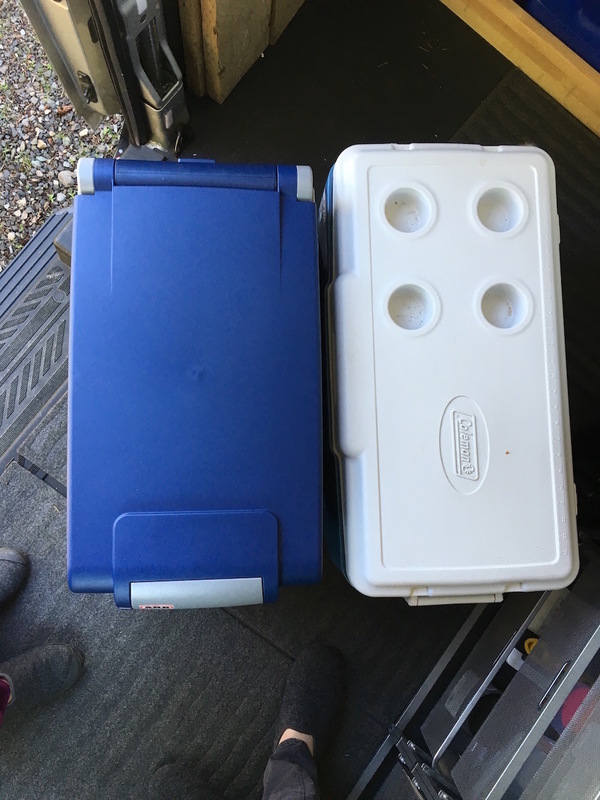 Our biggest expense in this phase has been an ARB 50 quart fridge-freezer ($854) which replaced the 70 quart Coleman cooler. We wasted too much time and energy trying to locate block ice which also dominated the space inside the cooler. 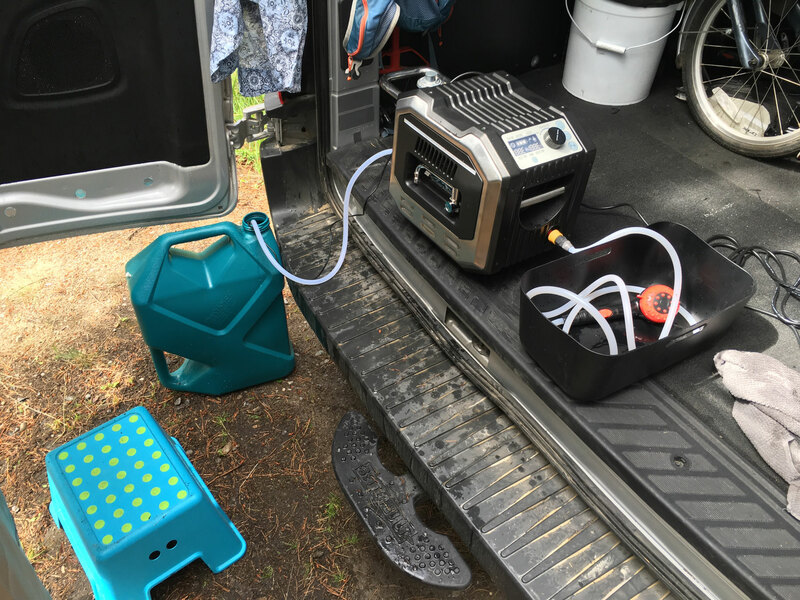 The ARB is made in Australia and is powered quietly by either AC or DC power. A wiring kit ($40) hooks directly to the vehicle battery rather than to the DC port (which shuts off 30 minutes after the van is turned off). The fridge has a built-in voltage monitor, but so far we’ve had no trouble with it depleting the battery, even after running for 2-3 days at a time. Ratchet cargo straps hold it in place and a cushion added to the top makes a nice seating option for its location by the sliding door. 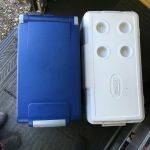 It’s been a huge improvement to have super cold beer and properly refrigerated food on extended trips. The WeBoost Drive 4G-M cell phone signal booster ($362) and Wilson Electronics 800/1900 Mhz Magnet Mount Antenna ($15) improves our Verizon cell signal (one to three bars). It runs off the van’s DC battery and from an AC power supply ($13) when we’re plugged into shore power. In case we ever lock ourselves out, we installed a Keyless Entry Pad ($70) from Ford. Techmat iPhone holders. ($10 each). One fits into the unused CD slot and the other uses the phone storage pocket to the right of the steering wheel. Slim magnetic plates slip into the backs of our iPhone cases, holding them securely in place when traveling over bumpy roads. A Weathertech floor mat covers the entire front floor ($140). It fits very precisely and contains the sand, dirt, pine needles and dirt we track in. 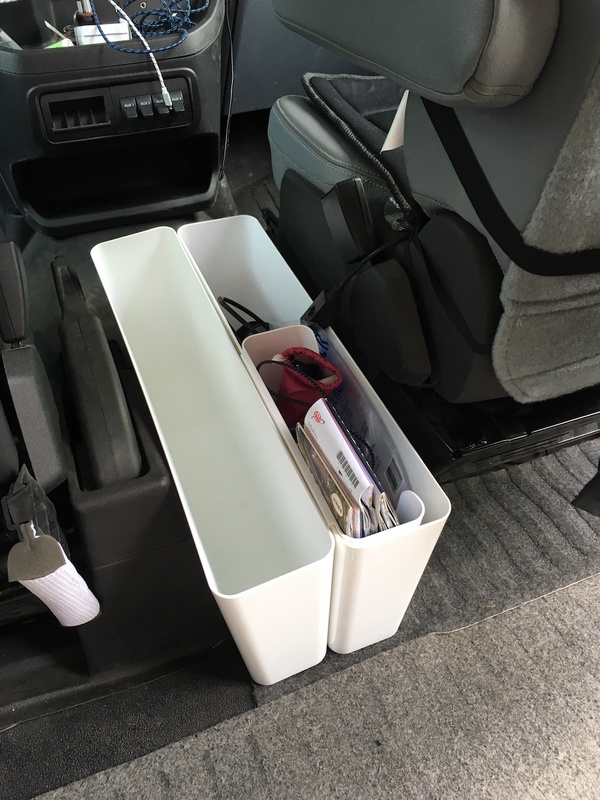 While being able to walk from the front to the back of the van was convenient, it meant giving up a LOT of storage space. 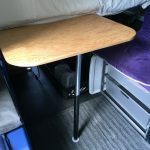 To switch the bed’s orientation from length- to width-wise, we used Superstrut to build a new frame and support rails. The frame is a simple rectangle with a single mid-point cross brace and reuses the OSB platform from the previous frame. 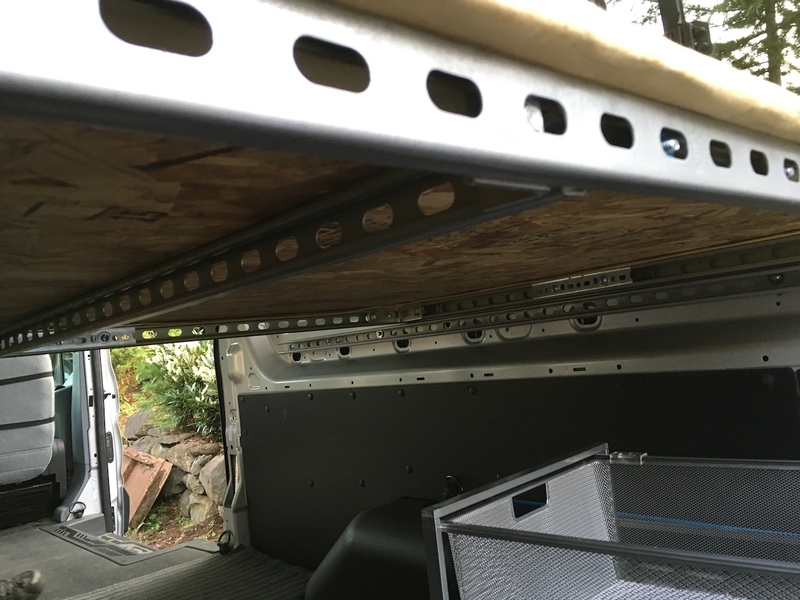 The frame “floats” on rails bolted to the van walls, just below the windows (Rivnuts anchor it to the existing holes). 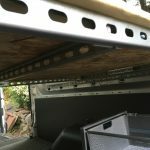 Cargo straps secure the frame to the vehicle tie-downs, allowing the bed to be moved fore and aft as needed. A two-inch thick natural latex mattress topper ($89) now softens our too-firm mattress. We tried a down feather bed but it had to be fluffed and re-set each day. Hypervent Condensation Prevention Matting ($86). The mat is about an inch thick, made of a random “thatch” of very stiff plastic fibers, which holds the mattress off the OSB layer to allow air to circulate underneath. David replaced the melamine counter with a beech butcher-block counter top. Several coats of Howard Butcher Block Conditioner protect the wood surface. 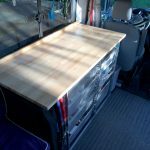 Recycled plywood was crafted into a small, stow-able table that clips to the bed frame and is supported by a single leg from an IKEA laptop table that didn’t work out. A Ceramic Infrared Cooktop Burner ($58) provides a non-propane cooking option when we’re plugged into shore power. 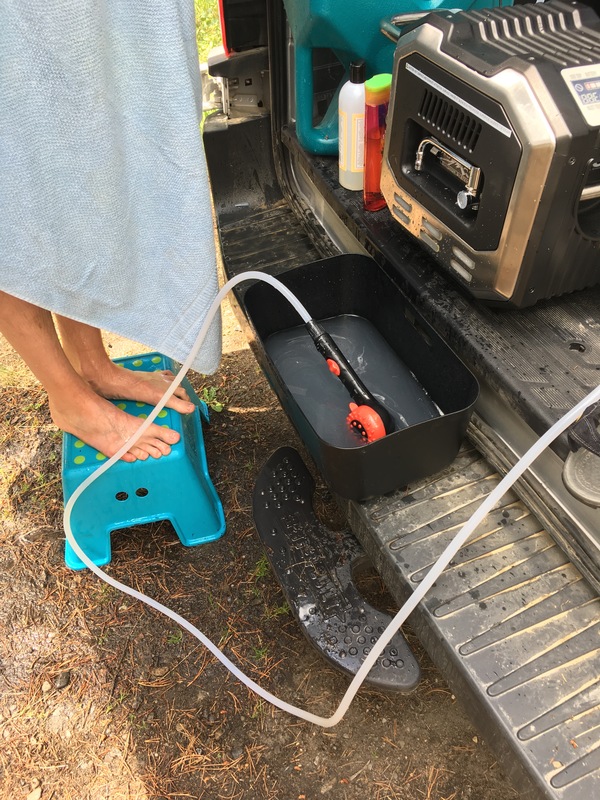 It was important for us to find a way to produce our own hot water, so we chose the BOSS-XCW20 BaseCamp by Mr. Heater ($357). BOSS stands for “battery operated shower system”. 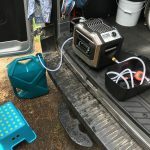 It dispenses instant hot water from a Reliance 5-gallon water container (the pump that comes with the unit fits perfectly through the container’s opening). Five gallons is more than enough for two showers and several rounds of dish-washing. 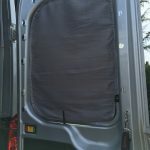 We’ve rigged an internal shower curtain solution for when privacy and/or cold temperatures prohibit outdoor showering. Shower curtains are suspended using IKEA curtain rings and clips from a length of curved PVC pipe held in place by bungie cords. 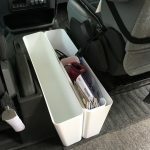 A plastic storage bin acts as a shower pan and storage for the BOSS when not in use. 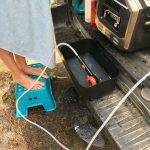 Water pressure is pretty good from the little submersible pump, but only if it’s at the same level as the water heater. In the photos, you’ll see that we started with the green water container on the ground. The pump struggled until we relocated it next to the BOSS. 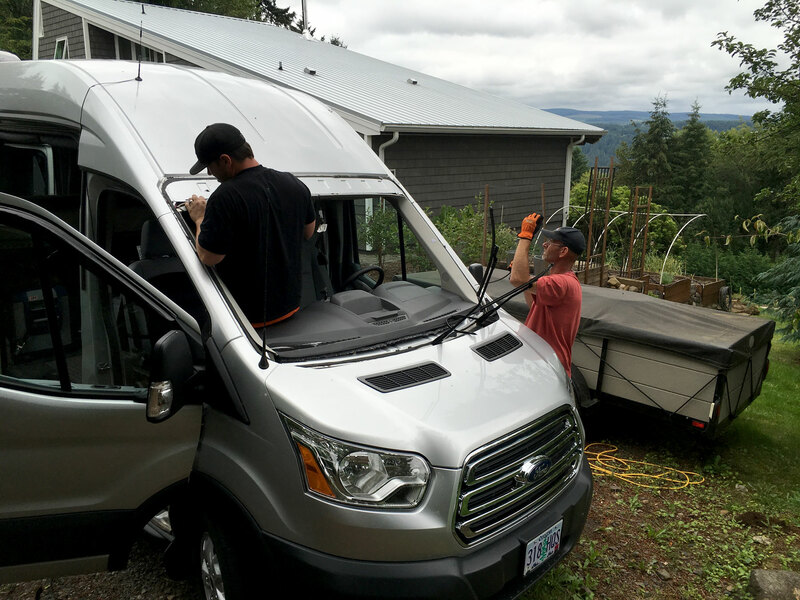 We’ve had to replace two of the cargo area opening windows due to frame cracks and hinge failure. Both were covered under warranty. Since the engineering on these window clasps is dubious, we make sure to firmly latch all the windows before driving. The windshield developed a long crack from the driver’s side upper corner, about half-way to the mirror. We thought it was a stress fracture, but the Ford service tech found a small rock chip in the opaque black area of the glass (which was impossible to see from inside), so it wasn’t covered under warranty. Our car insurance covered it (after the $250 deductible) and two technicians replaced it at our house which took about a half day. It was quite a job. Chris sewed fabric-covered Reflectix window shades. They roll up neatly and stay in place with a loop of elastic and magnetic hooks. The garden-variety Velcro used to hang the shades got upgraded to industrial strength 3M Velcro ($12 for 10′ x 1″ package). Inexpensive folding solar shades protect the windshield. 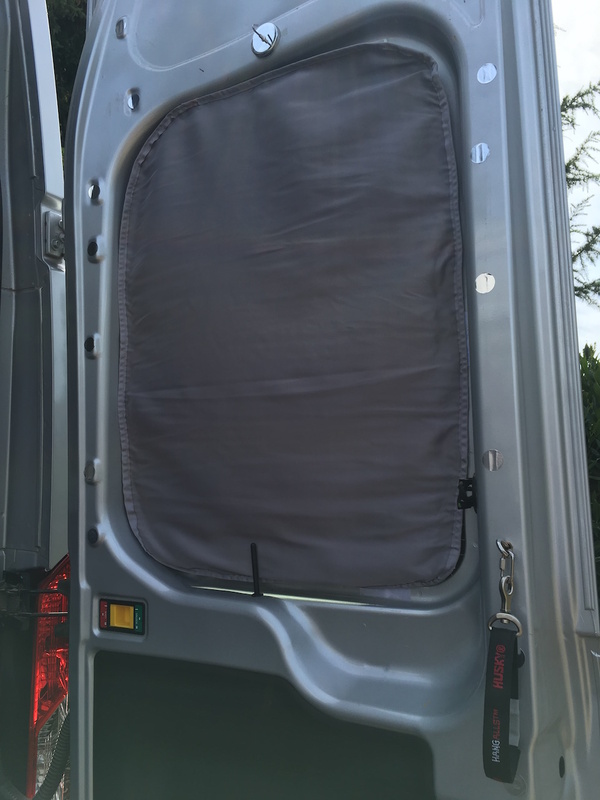 A second solar shade was cut in half on the diagonal trimmed to fit the passenger and driver’s side windows. Both passenger and driver’s side windows now have a wind and rain deflector ($75) . These plastic shields keep the rain out since we like to keep these windows rolled down about three inches. 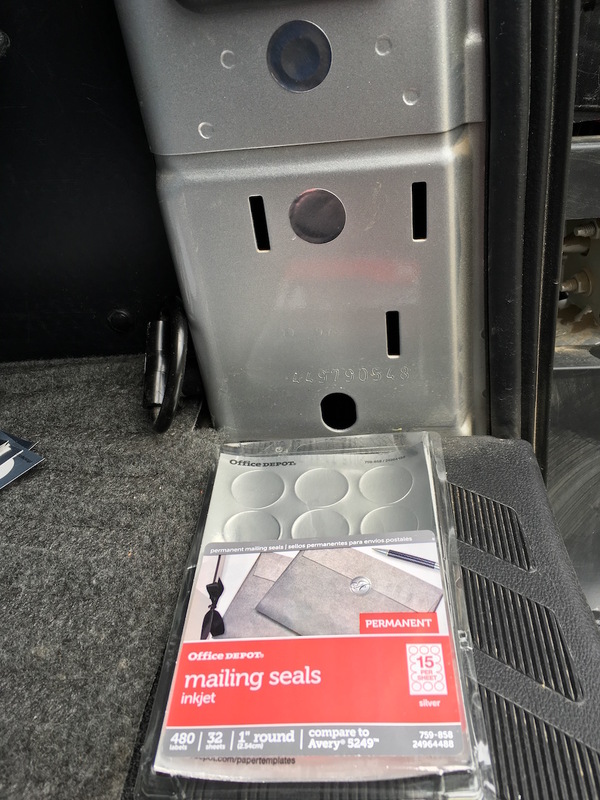 We modified a set of these IKEA hanging organizational bins to fit between the front seats. They’re the perfect size for our collection of DeLorme Atlases, maps and guides, journal, sunglasses, binoculars, and treats. The smaller sizes hang from a rail above the bed to hold our iPhones, flashlight and the Kindle at night. 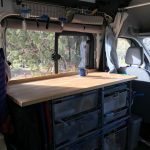 We added another set of three Elfa storage drawers under the bed in the rear to hold tools, extra cold weather gear and camping equipment like hammocks and micro spikes. Thirty-foot tow strap ($82), traction mats($120) are for “just in case”. 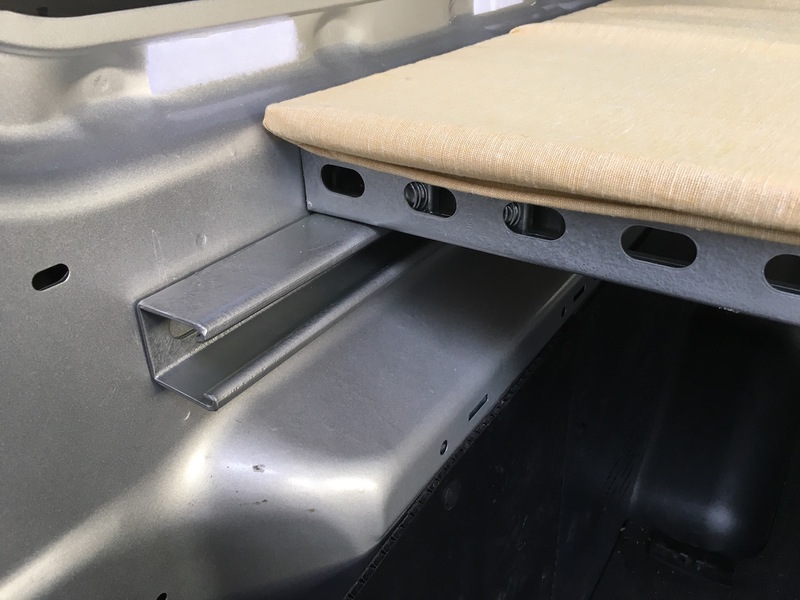 A Class 3 rear hitch ($118) holds a Better Built hitch step ($45) to make it much easier for shorter people to exit/enter the back compartment. We’re become big fans of the portable Bolt Power Battery Pack Jump Starter ($60) which have come in handy a few times (not on the van, thankfully). It also serves as an additional battery-powered USB power supply. Veepeak Mini WiFi OBDii scanner ($21) is one of the few scanners that work with the iPhone. It provides access to the Ford service codes and real time engine stats via the DashCommand App ($10). 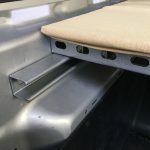 And last, but not least, a couple of hundred self-adhesive one-inch silver dots now cover up almost all of the holes in the cargo van body that would have been used to attach trim and interior fittings in the wagon model. We had way too many pesky box elder beetles and stink bugs hitching a ride, so hopefully these stickers will solve that problem! 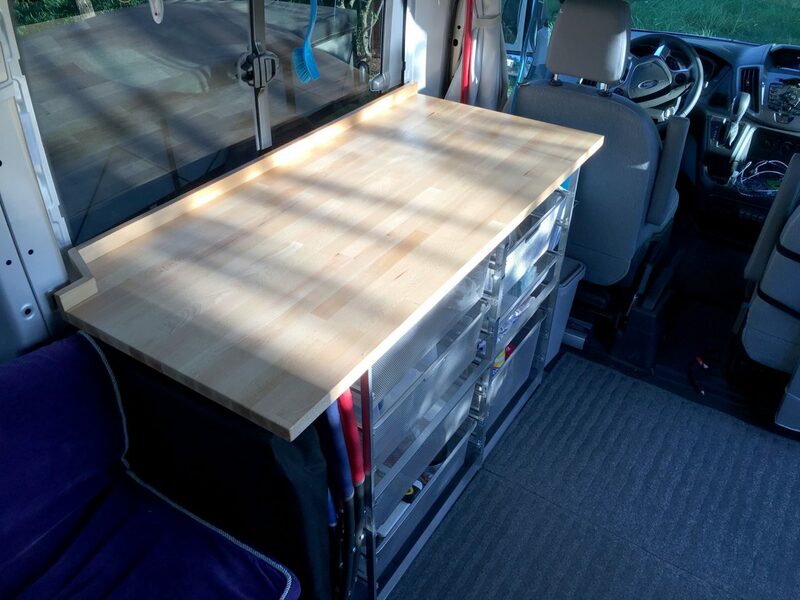 Grand total outlay for the Transit van and all upgrades to date: $48,000. How is the bed holding up..? I been on the fence with installation.. So far I like your ideas the best. So do the rivets hold firmly? There is no drilling needed? They fit into stock holes already there? is there a size rivet you used? Back to the bed.. have you been happy with the size? Does it fit snugly? any other recommendations? The bed is holding up quite well. The mattress fits between the window openings (which is wider than the cargo area), but would be tight if you wanted insulated walls. The rivenuts are easy to install and are holding securely. I purchased the Astro hand riveter tool which comes with several size nuts, including the ones that work in the existing Transit holes (1/4×20). 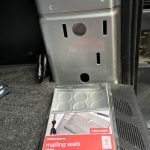 Good for you, installing the Maxxair yourself! 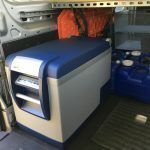 Make sure you check out the FordTransitUSA forum for LOTS more information and tips, especially the aftermarket windows which should be available in the near future. 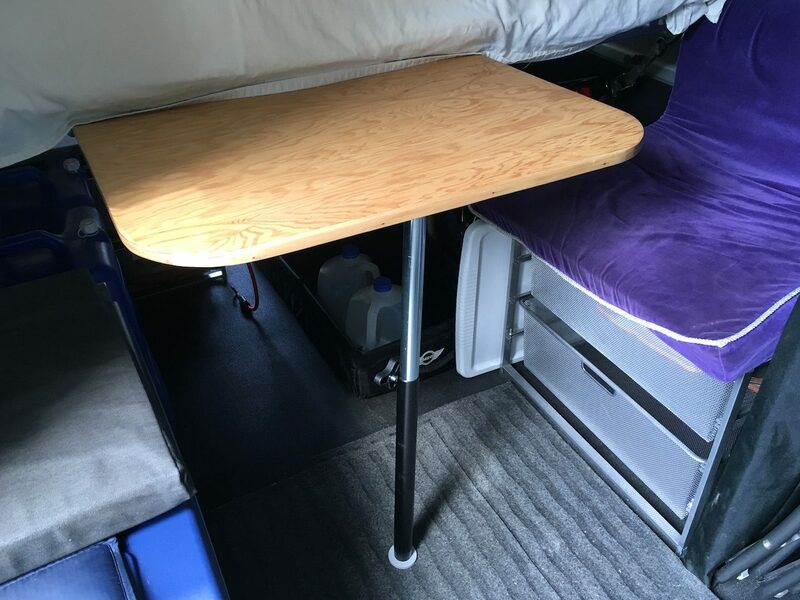 thanks for sharing all the details of your experience using the transit as a camper! i’m thinking of getting one for my journeys. what kind of mpg have you seen locally and on the highway in your year+ owning it? We’ve been getting about 18 (computer says 18.1) in mixed-but-mostly highway miles. 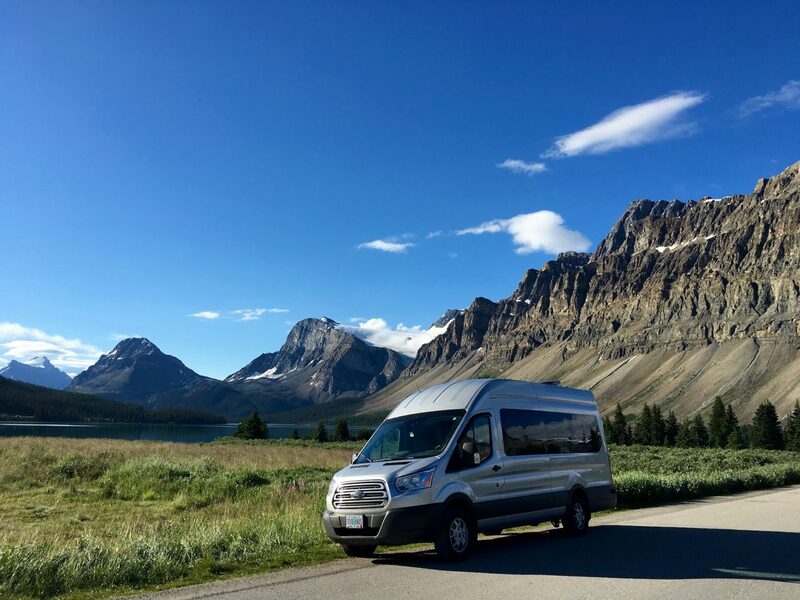 22,134 miles as of Oct. 6, 2016.
thanks, that’s great to hear you’re getting that much in the full size transit! do you have any estimate of how it does on shorter trips around town? The short answer is it depends on how you drive. I’m very conservative… slow and steady stops and starts. Wind resistance appears to be the biggest factor. The MPG drops quickly at anything above 65. Like I said, it’s 18.1 overall. Our conversion is pretty light, so the engine is not really taxed that much at slower speeds. Of course, extended idles will have an affect (on cold mornings we fire up the van heater for 10 minutes or so to take the chill off). I’m concerned about the moisture or condensation you mentioned. I am having someone do it for me. We chose an RV sized queen bed 60×75. The walls will be insulated with board covered in marine grade carpet. We chose marine grade because we travel with 2 large dogs and a cat. They are in crates under the bed. The crates are 30 inches tall so the bed will be in the window area. We will have the windows boxed off and with curtains covering them. Funny but. Our van is also the silver one. Looks just like yours. I love the way it handles except on highways with huge trucks flying by and/or wind. Hi Ken! 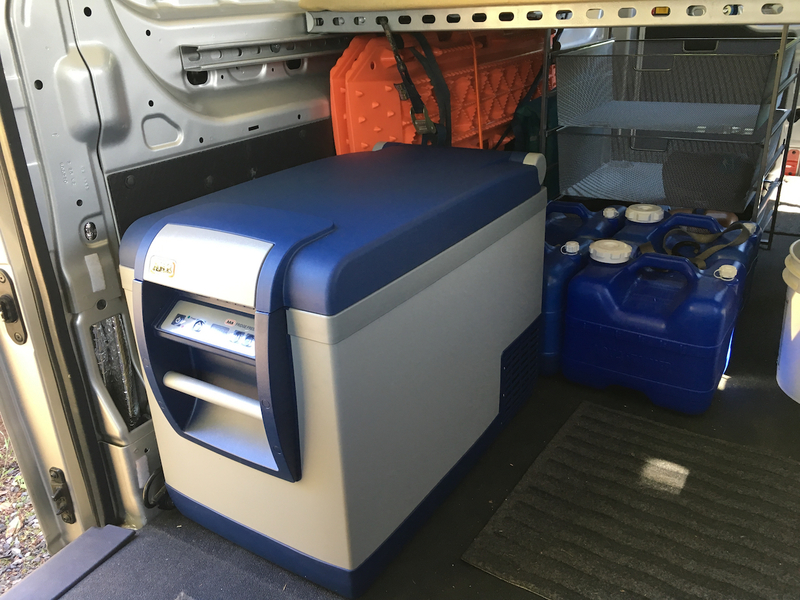 We ended up putting a layer of the blue jeans insulation on the floor, below the stock transit plastic flooring (it has some insulation on the bottom, but not much). This made the floor a bit softer and less uneven (walking on the stock floor in the dark could be a challenge to keep your balance!). We added an inexpensive area rug over the plastic for a nicer feeling on bare feet. Floor feels insulated from the metal below, though the way our ventilation works means the floor is always the coolest part of the interior. So far, the Coroplast is holding up well and I would use it again!